Embark on a grand voyage from Asia to Europe on the second semester of Road Scholar World Academy 2016. Sail waterways including the Java, Arabian, Red and Mediterranean Seas, transit the famous Suez Canal and go ashore to explore 12 countries. Make yourself at home on the elegant ms Rotterdam, experiencing in-depth learning, getting to know your fellow explorers in a collegial setting and enjoying delicious cuisine and an array of enrichment activities. Afternoon: Take the afternoon to unpack and relax. In the early evening meet with your group leader for a program orientation and group introductions. Review the program theme and itinerary, discuss safety guidelines, emergency procedures, roles and responsibilities and answer any questions you may have. Indicated times are approximate. Program activities, schedules, and personnel may need to change due to local circumstances. In the event of changes, we will alert you as quickly as possible. Dinner: Aboard the ship. A group dinner will take place every night aboard the MS Rotterdam in La Fountaine, the ship's main dining room, located on Decks 4 and 5. Dinner consists of four courses (appetizer, soup or salad, main dish and dessert) and the menu will change nightly. Other dining options on board the ship include the more casual Lido Restaurant (popular for breakfast and lunch), the pool side Terrace Grill or 24 hour room service. For an additional charge, you may opt to dine at the Pinnacle Grill specializing in aged steaks, lamb, poultry and seafood. Morning: Singapore is a treasure trove of public art, if you know where to look. Dotted throughout the city you will find beautiful sculptures created by international artists such as Salvador Dali, Henry Moore, and Fernando Botero. An art expert will take you through the city to see some of these hidden (and not so hidden) gems. Finish the morning with a visit to the Singapore National Art Gallery*. Through a comprehensive collection, the National Gallery focuses on Southeast Asian art, including Singapore art, from the 19th century to present day. *Please Note: The Singapore National Art Gallery is a new museum scheduled to open in 2015. Morning: Join your study leader for an onboard educational presentation. Afternoon: Afternoon at leisure to enjoy the amenities and activities on board the ship. Morning: Disembark in Tanjung Priok, the main port serving the city of Jakarta on the island of Java. Get a feel for modern Jakarta (the second largest city in the world) as you pass by iconic sites such as the National Monument and the Istiqlal Mosque. Next, delve into the past at the National Museum, which offers historical, prehistoric, archeological and ethnographic aspects of Indonesia through its extensive collection of artifacts and relics. It is one of the most complete collections in the country of bronzes and ceramics dating back to the Han, Tang and Ming Dynasties. The museum's collection of cultural instruments, household utensils, arts, and crafts provide a good introduction to the life of Indonesia's various ethnic groups. Lunch: Lunch, featuring a set menu, will be served at an authentic Indonesian restaurant situated the city's historic district. Afternoon: After lunch, return to the harbor to rejoin the ship. Morning: Today you will travel to one of the most spectacular sites in Asia, and the world's largest Buddhist complex - Borobudur. Built in 800 A.D. during the reign of the Sailendra Dynasty, this shrine to Buddha was quickly abandoned following the decline of Buddhism and Hindu Kingdoms and the rise of Islam in Indonesia. For centuries the complex laid forgotten under layers of volcanic ash until knowledge of its existence was sparked by Sir Thomas Samford Raffles in 1814. The site underwent a major restoration from 1975 to 1982, after which it was named a UNESCO World Heritage Site. Lunch: Lunch at a local restaurant en route. Afternoon: After lunch, continue to Borobudur. At the site, you will climb to the top of the pyramid. Learn about the history and meaning of the site and take in the view of the Menoreh Mountains. Enough time will be given at the site to stroll around the complex and take in it's beauty. Morning: Mount Bromo is an active volcano and part of the Tengger Massif, in East Java, Indonesia. At 7,641 feet, Bromo is not the highest peak in the range, but it is the best known of them all making it one of the most-visited attractions in East Java. The volcano belongs to Bromo Tengger Semeru National Park. Mount Bromo sits in the middle of a vast plain called the Sea of Sand - a protected nature reserve established in 1919. Today, you will visit Mount Bromo the way the locals do. Transfer by coach to the nearby mountain village of Cemoro Lawang, where you will then continue on to Mount Bromo by 4-wheel drive vehicle. Walk (or take a pony ride) the remainder of the way to the crater. Mount Bromo stands in a sea of ashen, volcanic sand, surrounded by the towering cliff of the crater's edge. The immense size of the crater and supernatural beauty of the surrounding scenery are really very special indeed. Re-board the 4x4 vehicle for the drive back to Cemoro Lawang where an Indonesian buffet lunch awaits. Afternoon: After lunch, coach back to the ship in Probolinggo. Activity note: You will disembark the ship for 1 night, please remember to pack a carry-on bag. You may leave your remaining belongings in your cabin on board while you are away on the extended shore excursion. Morning: Disembark the ship and head to Mas village where you will witness age old wood carving techniques, and then to Celek to discover the exquisite silver. Then continue to the temple of Tirta Empul. Locals believe that by bathing in the waters of this holy spring, they will purify one's self from bad influences in life. Lunch: Lunch will be served in Kintamani, overlooking the caldera lake of Danau Batur. Afternoon: After lunch drive to Penglipuran, a traditional Balinese village 700 meters above sea level and surrounded by bamboo forests and coffee plantations. It is a unique village in Bali because its inhabitants still live according to strict centuries old rules and regulations (the Adat) just like their ancestors before them. Continue on to Ubud where you will check into your hotel for one night. Morning: Check out of the hotel and spend your day exploring Ubud and the western part of Bali. Ubud is well known for its fine art, and is home to a score of local and foreign artists. One of them is the Agung Rai Museum of Art, which has an extensive collection of paintings by Balinese, Indonesian and foreign artists in classic Balinese and contemporary styles. Afterwards, see Ubud Palace and test your bargaining skils at the Ubud market. Lunch: Continue to the western part of the island and stop for lunch at a local restaurant. Afternoon: Continue to Pura Taman Ayun, a temple founded by the King of Mengwi in the 17th century. It has three descending levels of spacious courtyards containing rows of shrines and pavilions and surrounded by a wide moat. The last stop will be at Tanah Lot Temple - one of the holiest temples in Bali, built atop a huge rock and surrounded by the sea. Enjoy the wonderful sunset at the temple, then return to the harbor to re-board the ship. Morning: Just east of Bali, lies the island of Lombok. With its beautiful beaches, lush forests, enchanting waterfalls, and relatively few tourists, Lombok is often referred to as an "unspoiled Bali". With few exceptions the natural landscape and traditional culture has remained unchanged for hundreds of years. Leaving the pier, your first stop will be at the arts market of Sayang-Sayang. Next, visit the unique Temple Lingsar - the only Hindu temple in the world where Muslims and Buddhists, alongside Hindus, worship together in the same place. 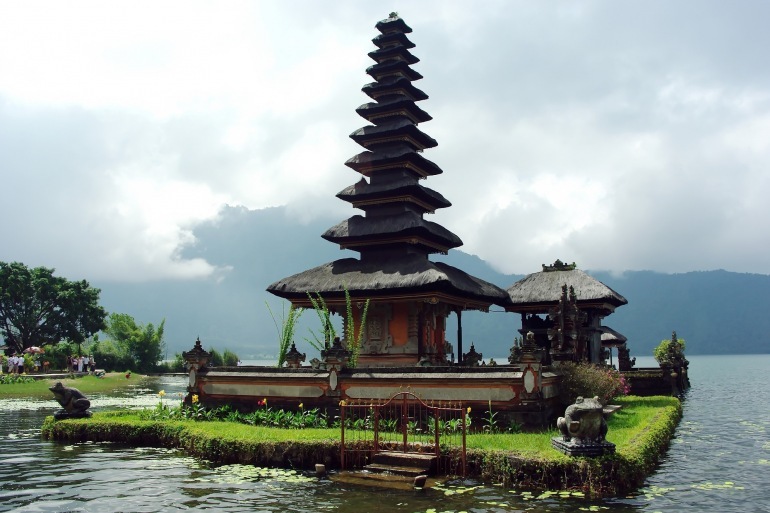 This temple, built in 1714 and rebuilt in 1878 symbolizes the harmony of life in Lombok for centuries. The next stop will be at Narmada Palace, built in 1727 by King Anuk Agung Gede Ngurah Karang Asem as the royal garden and place of worship. It's spring water is said to grant eternal youth to its visitors. Afternoon: After lunch visit Sakarara Village, renowned for its traditional hand weaving of brightly patterned songket, ikat and sarong cloth. End your day back at the ship in Lembar, the principal port city of Lombok. Morning: Growing up to 10 feet in length and 150 pounds, the Komodo Dragon (also known as the Komodo Monitor) is the largest species of lizard living on earth today. Komodo Dragons are found only on the Indonesian Islands of Komodo, Rinca, Flores, Gili Motang and Padar which form Komodo National Park, a UNESCO World Heritage site and one of the "New 7 Wonders of Nature". Today the ship will anchor off the coast of Komodo Island, and a local guide will take you around the island in search of these legendary creatures. Morning: The capital city of East Java and the island's second-largest city after Jakarta, Surayabaya is your gateway to the historical intrigue of old Java. Step inside the earliest Dutch government building in Surabaya for a warm Javanese welcome by the Mayor of Surabaya, watch a traditional dance with refreshments and enjoy a brief tour of this heritage building. At the Submarine Monument see a Russian submarine used in 1952 by the Indonesian Navy, a reminder of the fragile alliances forged throughout Asia in the post-war era. Afternoon: After lunch visit the Kayoon Flower Garden market, located on the west bank of the Kayoon River, where vendors offer a variety of fresh and dried flowers, artificial gardens, beautiful orchids and tropical decorative blossoms. Next visit the house of Sampoerna - a clove cigarette factory, and now museum, built in the Dutch Colonial style that dates back to 1858. Behind the museum is the modern factory where you'll see the process of clove cigarettes (a major export of Indonesia) being made. Morning: Ninety minutes from Surabaya in the Trowulan area, are the 13th to 16th-century archeological sites of the Majapahit Hindu Kingdom. Start at the Trowulan Archeological Museum, which houses superb examples of Majapahit sculpture and pottery from East Java. From there continue to Segaran Pool - the largest ancient pool used as a place of recreation for the Majapahit family. The most interesting ruins here include the entrance to the Bajang Ratu Temple, with its strikingly sculpted Kala Heads and the Tikus Temple used for ritual bathing and cleansing. Lunch: Lunch at a restaurant in the village of Pacet. Afternoon: After lunch enjoy a brief visit to the nearby Toga Garden, before returning to the ship. Afternoon: Afternoon at leisure to enjoy the amenities and activities on board the ship as we arrive in Singapore in the early evening. Morning: Food is a passionate subject in Singapore, as it is seen as a common thread among many different cultures. Influenced by Malay, Chinese, Indian, Indonesian, and Western cultures, the visitor is presented with a wide variety of options not found anywhere else in the world. Today you will have the chance to experience just some of the diversity this "foodie" city has to offer. Lunch: Lunch will be at a typical Singaporean food court. Choose from a dizzying array of "hawker stalls" (individual booths), featuring both familiar and exotic fare. Afternoon: Enjoy some free time and then transfer back to the ship. Morning: Disembark the ship and transfer to Kuala Lumpur. Visit the National Mosque, which is the most distinguished mosque in Kuala Lumpur. Another must see is the Tugu Negara or War Memorial where we honor those who perished in the war. You will also pass the Moorish-styled Federal Court, the old Railway station which is a striking piece of Mohammedan architecture, the Tudor-styled Cricket Club and the King’s Palace. Visit the Thean Hou Temple situated in Robson Heights, which is the home to patron Goddess Thean Hou of the Hainanese community. This striking six-tiered temple is regarded as one of the biggest Chinese temples in South East Asia. Morning: The Pinnawala Elephant Orphanage provides visitors with the best chance of seeing a large number of elephants at close quarters. The orphanage was established in 1975 with seven orphaned elephants. Today some of these orphans enjoy the fortune of seeing their grandchildren born in the same location. Assisted by local and foreign elephant experts, Pinnawala commenced a successful captive breeding program and the first baby elephant was born in 1984. It is most interesting to visit at feeding time to see the baby elephants being bottle fed and the entire herd taken for a bath thereafter to the river near by. Afternoon: In the afternoon, proceed to the picturesque city of Kandy. Along the way you will pass many colorful sights including little villages, paddy fields, coconut estates, and rubber plantations. Kandy itself is nestled in the foothills of the Hill Country on the banks of a beautiful tree-lined lake. Upon arrival to this naturally fortified town, continue on to the Royal Palace complex for a visit to the Temple of the Sacred Tooth Relic. The Temple of the Sacred Tooth Relic is a Buddhist temple which houses the relic of the tooth of Buddha. Since ancient times, the relic has played an important role in local politics because it is believed that whoever holds the relic holds the governance of the country. Morning: Depart the ship this morning for a unique, full day field trip to learn more about agriculture and small industry in Sri Lanka. From the pier, you drive to Uyanwatte Reservoir, in Bandaragama. Here your local guide will give you a brief introduction to the irrigation system in Sri Lanka, and you will see the Kithsirimewean Buddhist Temple, which dates back over 1700 years. After visiting the temple, delve more into the local culture with a guided walk through Millaniya Village - see a rice paddy field, learn how pineapples, cinnamon, tea and rubber is grown, and processed. Lunch: Lunch of rice, curry and fruit at the village. Afternoon: After lunch, you will learn more about some of the small scale industries that help drive the Sri Lankan economy. Visit a traditional iron workshop and learn how clay pottery and weaving are made on a small scale. Morning: India's largest port, commercial and industrial center, fashion capital and heart of Bollywood (India's thriving movie industry), Mumbai is an endlessly fascinating hive of activity. Mumbai is a jumble of captivating contradictions: grand colonial architecture rubs shoulders with chaotic bazaars. Trendy restaurants, exclusive boutiques, slums and shanty towns, all interspersed with tropical palm trees. A melting pot of cultures from every corner of the country, Mumbai embodies India's diverse traditions. After breakfast, disembark and coach to the Gateway of India. Mumbai's most famous monument is the starting point for visitors who want to explore the city. It was built as a triumphal arch to commemorate the visit of King George V and Queen Mary in 1911. Ironically, when the Raj ended in 1947, this colonial symbol also became sort of an epitaph: the last of the British ships that set sail for England left from the Gateway. Next you will embark a boat to sail towards the Elephanta Caves (approx. 1 hour boat ride). The Elephanta Caves, which are declared as a UNESCO World Heritage Site, date back to the 6th century AD. It was a Portuguese who named the caves after the statue of an elephant which is seen close to the area. Afternoon: After lunch, witness Mumbai's colonial heritage through sites such as the Victorian Gothic Revival, Rajabhai Clock Tower, Mumbai University, High Court and Chatrapati Shivaji Maharaj Terminus. Stop at a Dhobi Ghat, or a public laundry, to see the sight of many men collectively washing, rinsing and drying clothes in the open air. Finally visit the Chhatrapati Shivaji Maharaj Vastu Sangrahalaya (formerly the Prince of Wales Museum). Founded in the early years of the 20th century, the museum houses approximately 50,000 exhibits of ancient Indian history as well as objects from foreign lands. See artifacts from the Indus Valley Civilization as well as other relics from ancient India. Morning: From the port of Mumbai, coach along Marine Drive and Malabar Hill to the Hanging Garden. Perched at the top of Malabar Hill these terraced gardens are also known as the Ferozeshah Mehta Gardens. Next visit the Mani Bhawan. Located on leafy Laburnum Road, Mani Bhawan is the old Mumbai residence of Mahatma Gandhi. It's a two-storied structure that now houses a reference library with over 2000 books, a photo exhibition of Gandhi's life, and well preserved memorabilia including an old charkha, or spinning wheel, that Gandhi used to use. Today, its only exhibit that lies unused, but many old Gandhians still visit the place to pay homage to their hero and demonstrate the noble art of spinning your own yarn. Next, you will have the chance to explore the Crawford Market before returning to the ship. Morning: Depart the ship for the fishing village of Taqa, an old town with an interesting castle surrounded by watchtowers and taqa stone houses. Next travel to Khor Rori creek, the site of the ruined city of Samhuram and the capital of Arabia's Frankincense trade. Excavation has produced evidence of an ancient city with trade links by sea to far eastern destinations, as far off as Greece. Mirbat, the ancient capital of Dhofar, was an important town as early as the 9th century for its trade in Frankincense, horses and slaves. Your final stop will be at Dhofar's best known historic site- Bin Ali's Tomb. This twin-domed tomb of Mohamed Bin Ali which dates back to 1135 AD is a fine example of medieval architecture in the middle east. Lunch: Return to the ship for lunch. Morning: This morning we will disembark the ship and transfer from the Aqaba port to the magnificent Wadi Rum for a visit in 4x4 cars (simple local 4x4 vehicles owned and operated by local Bedouins of the area). Lunch: The 4x4 vehicles will drop you off at a Bedouin camp where you will have lunch under a Bedouin tent. Afternoon: After lunch, the 4x4 vehicles will transfer you back to your bus. Board the bus and transfer back to the ship. Activity note: Today's excursion will involve a lot of walking over uneven terrain, and is not recommended for people with mobility problems. There are horse drawn carriages at the site of Petra that can assist (for an additional charge), however they are available only on a first come, first serve bases, and cannot be guaranteed. Morning: Disembark the ship and transfer by coach to the site for Petra. Spend the morning exploring the monuments and settlements. The name, Petra, derives from the Latin word, Petrae, meaning rock. Numerous archaeological excavations have taken place since its “discovery” in 1812 by Swiss explorer Johann Ludwig Burckhardt. Hidden in a great rift valley east of Wadi 'Araba, 80 kilometers south of the Dead Sea, Petra was the principle city of ancient Nabetaea, though subsequently ruled by several other empires including: Roman, Byzantine, and Persian. Lunch: Lunch at a local restaurant. Afternoon: After lunch, transfer back to the ship. Morning: The ship will spend the day sailing through the Suez Canal. Morning: This morning, we will board the coach and visit the beautiful coastal town of Sorrento. Overlooking the Bay of Naples it is known for it breathtaking views. We will visit the town center and have some free time to explore. Lunch: Lunch at a local restaurant at the city center of Sorrento. Afternoon: Pompeii, buried under ash during the devastating eruption of Vesuvius in AD79, provides an evocative and fascinating insight into the daily life of a prosperous Roman city. Among the extensive ruins are impressive temples, a forum, one of the largest known amphitheaters in the world, beautiful homes, and streets lined with shops and houses. After your visit to Pompeii, we drive back to the ship. Morning: After breakfast, disembark the ship and transfer to Rome. Upon arrival we will be met by out local expert and visit the beautiful Galleria Doria Pamphili. This private art collection housed in the Palazzo Doria Pamphilj is one of the hidden gems of Rome. It features sculptures and paintings from artists such as Caravaggio, Fra Filippo Lippi, and Raphael. Lunch: At a local restaurant in Rome. Afternoon: Enjoy some free time before transferring back to the passenger terminal at the port of Civitavecchia. Morning: Ajaccio is most famously known as the birthplace of Napoleon Bonaparte, and reminders can be found all around this charming port city. Ajaccio is best explored on foot, so today you will meet your local expert at the port for a walking discovery. After, enjoy some free time to explore the charming shops and patisseries. Lunch: Lunch on board the ship, or stay in town to enjoy lunch independently in Ajaccio. Morning: Morning at leisure as the ship sails towards Ceuta, Spain. The ship will arrive in Ceuta at 12:00 noon. Afternoon: After lunch, disembark the ship and transfer 45 minutes to the city of Tetouan, Morocco (please note: you will need to bring your passport with you). The city is located on a picturesque slope of a fertile valley, and surrounded by citrus and almond orchards. With a local guide, explore the well-preserved medina (old town), a UNESCO World Heritage Site, noted for it's white washed houses and Andalusian influenced architecture. Lunch: Lunch independently to eat at the restaurant of your choosing. Afternoon: Return to the ship in Cadiz. Morning: Visit the pilgrimage city and UNESCO World Heritage site of Santiago de Compostela where the relics of the Apostle St. James are supposed to have been discovered in the 9th century. Enjoy a guided visit to the magnificent Cathedral and Treasury, the cloister and the Museum of Tapestries. Afternoon: Transfer back to the ship in A Coruna. Morning: Disembark the ship and transfer to the airport (1 hour) for flights eturning to North America. We hope you enjoy Road Scholar learning adventures and look forward to having you on rewarding programs in the future. Please be in touch via the Road Scholar Social Network, were you can share memories, pictures, and comments. Best wishes for all your journeys. The standard-bearer for our fleet of ships, ms Rotterdam launched in December 1997. We are pleased to introduce our latest innovation, Lanai staterooms, to Rotterdam. Your onboard experience will be defined by spacious, artfully appointed public areas, venues, features, and amenities. Guests aboard will enjoy elegant dining rooms, a $2 million art and antique collection, wide teak decks and spacious staterooms — many with private verandahs. Our stateroom enhancements include expanded stateroom choices and a complete update to all stateroom furnishings. Rotterdam ensures you the ultimate onboard experience with her graceful combination of classic cruise ship features and state-of-the-art amenities. The standard-bearer Holland America's fleet of ships, ms Rotterdam launched with the latest Signature of Excellence enhancements completed in December 2009. Your onboard experience will be defined by spacious, artfully appointed public areas and the latest Signature of Excellence venues, features and amenities. Enjoy elegant dining rooms, a $2 million art and antique collection, wide teak decks and spacious staterooms - many with private verandas. Stateroom enhancements include expanded stateroom choices and a complete update to all stateroom furnishings. Rotterdam ensures you the ultimate onboard experience with her graceful combination of classic cruise ship features and state-of-the-art amenities. . The resort is located right in the heart and soul of Ubud, the centre of art and culture in Bali, with one main entrance at the famous Monkey Forest Street, flanked by many good quality gifts shops, renowned restaurants and night-spots.